The mash was perfect. I hit the strike temperature and the mash stayed right around 148 degrees, right where I wanted it. The pre-boil volume and gravity were pretty much right on. The boil went fine. I used hop sacks to keep the hop matter somewhat contained. Even so, there was quite a bit of hop matter in the wort. The wort tasted nice and hoppy and it was a perfect red color. 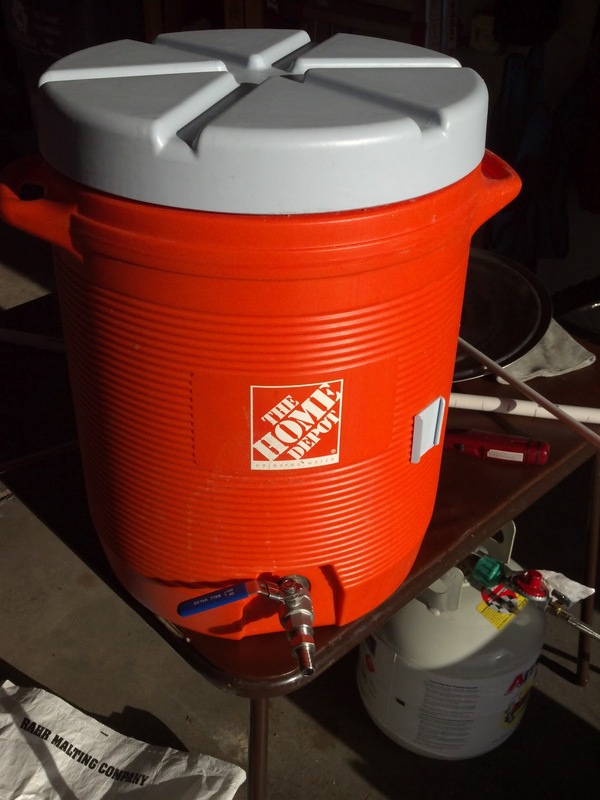 I really could not have imagined a better brew day. I never did step-up my starter of WLP 007. I probably should have. The starter tasted sort of cidery. I am hoping my bigger bolder malt bill will ferment differently than the extra light DME. I am a bit concerned, but I'll just ferment cool and see how it goes. 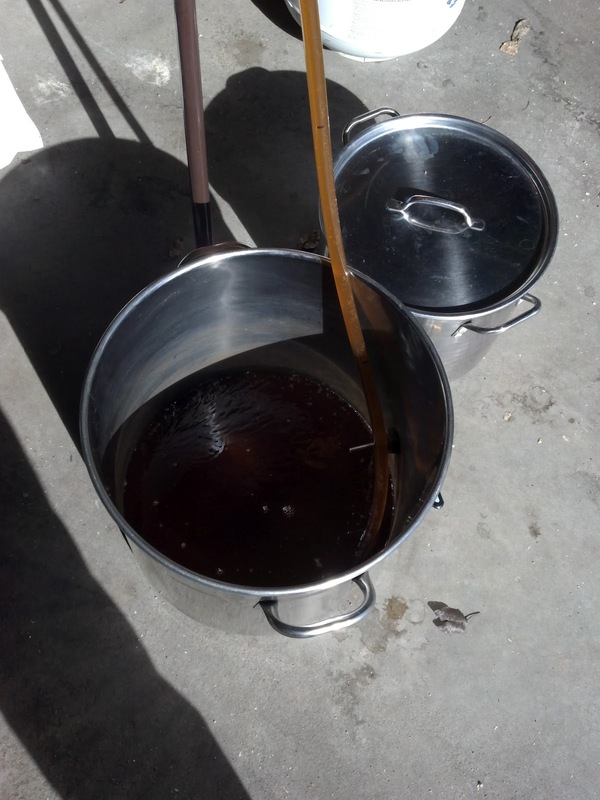 Filling up the brew pot through the sparge. My pre-boil sample. Isn't it a beautiful beer? 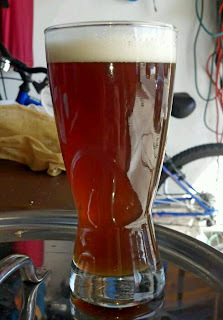 This is my Eric's Red, which I sampled during the boil. 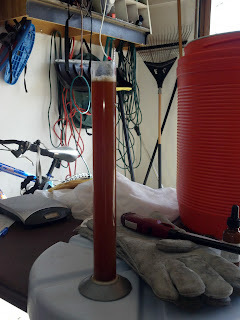 That last picture is my Eric's Red, which I mentioned not too long ago on this blog (see Eric's Red Brew Day). I have it on tap in my keggerator, and it really tastes yummy. It is pretty much exactly what I wanted Eric's Red to taste like. I am pleased with the beer. I had some issues with the flow coming out of the tap. I have the pressure up to 12 psi and am not getting as much of a flow as I would expect at that pressure. It is ok, but I must have some trub clogging something. I checked the poppet valve and the dip tube and both were clear, so I am not sure what is going on. It is coming out nice and clear, though, so I will not let it worry me too much. This past week, I brought some of my Eric's Red Failure into work to give away. People seem to actually like it. In fact, I think most of them prefer the Failure to Stouticus. Actually, it did not turn out too terribly bad. It is thin (as expected), but doesn't really taste too watery. The malt flavor is actually very nice. It is a very good session beer at 3.9% ABV. The beer model and I tasted my Apricot Lovin' American Wheat today. It has been in a secondary fermentor for about a week and a half now (see Racking on Puree). It has a nice amount of apricot flavor and I am ready to get that kegged and bottled up. Even if "Chad" doesn't like it, I do think the Beer Model and I will have no trouble drinking it. 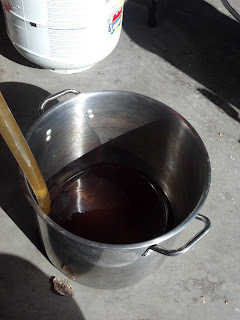 Well, anyway, PIRA is fermenting away, and I will let you how it turns out. Stay tuned.